This summary provides a high level overview about establishing, opposing and enforcement of home-based businesses in residential communities. For complete details, see Home Based Business on the City of Winnipeg website. 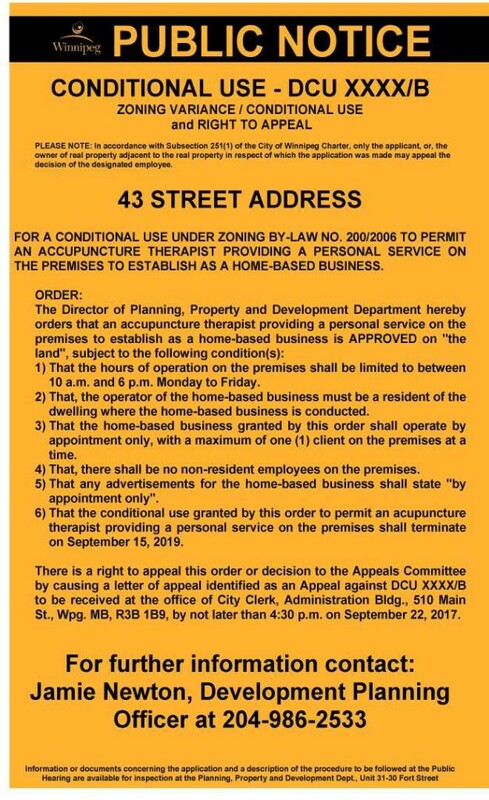 If a resident is applying to the City for a permit and approval, they must post a sign on their property for 14 days (similar to the image shown), highlighting special conditional uses. Many types of home-based businesses are allowed under the City’s zoning by-law with the issuance of a Home Occupation Permit prior to establishing the business. The Zoning By-law regulates Home-Based Businesses by ensuring the character of a residential area is not impacted by noise, traffic or other nuisances associated with a commercial enterprise. A Home-Based Business Permit prior to establishing. Is there a negative impact on neighbours / neighbourhood? Is the application consistent with Plan Winnipeg and Secondary Plans? Is the variance a minimum modification to the Zoning By-Law to relieve injurious affect? Is the application compatible with the area? You can appeal the application and register in opposition ONLY IF you are a registered home owner within 1 km of city property. Contact the City Planning Officer indicated on the sign. NOTE: You MUST register by the appeal deadline. There is no fee to register in opposition, and opposition is noted on the public record. Your reasons for opposition should reflect how the home-based business does not meet the criteria listed above. The City Clerk will set a date and time for an Appeal Committee meeting. You will be required to attend the meeting to state why you think the home-based business application should be rejected. Once a home-based business is approved, it’s up to the neighbours/neighbourhood to report any potential infractions by E-Mailing 311@winnipeg.ca or phoning 311. The City of Winnipeg operates on a complaint based system due to limited resources, but will send out an By-Law officer when available to investigate any complaints. To be upfront – there are challenges to investigating and enforcing home-based businesses, similar to the challenges of illegal rooming houses. Once the necessary permits have been issued, it becomes more difficult to enforce infractions.